Do you have a headache that just doesn't seem to go away? Are your teeth worn or cracked? Are you aware of grinding or clenching your teeth during the day or while you sleep? Do your jaw or neck muscles feel stiff and painful? If so you may have TMD (often called TMJ). Dr. Woolwine has had extensive training in TMJ therapy at the internationally recognized L.D. Pankey Institute (www.pankey.org) I Key Biscayne, Florida. The Pankey Institute specializes in the study of occlusion (developing a correct and stable bite relationship) and the treatment of TMD disorders, and is considered by many to be one of the leading teaching institutions for research and treatment of TMD disorders. 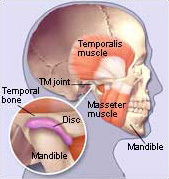 TMJ is an acronym for the temporomandibular joint. TMJ is an anatomical orthopedic joint, just like many other joints in your body. The key to the health of any joint, including this one, is lubrication. Most disorders of the TMJ are related to the lack of lubrication in the joint space. It is susceptible to the same problems as all your joints. Disorders of the TMJ are medical problems that require mainstream medical orthopedic treatments like orthotics, medications and physical therapy. TMJ has been used by many people through the years to actually describe TMD which is an acronym for temporomandibular disorder. TMD describes many symptoms related to the jaw and supporting structures. TMD can include TMJ problems, as well as muscle pain, headaches and other types of facial pain. This disorder is a subgroup of orofacial pain that include many different types of pain in the head and neck. The TM joint itself is located directly in front of the ear and is commonly called the jaw joint. If you have any of these symptoms for more than a month, you should seek treatment. The TM joint is subject to degeneration. When the degenerative process exceeds the body's ability to adapt, there is pain or loss of function. The doctor's job is to identify all the risk factors driving this degeneration, and treat them appropriately. Most of the time it is over-activity of the clenching muscles, so the treatment sequence is usually designed to deal with whatever is driving those muscles. During the day, it is common for the cause to be clenching, in response to stress. At night, it is usually a collapsing airway, and possibly sleep apnea, that leads to clenching and grinding. While the treatment usually entails an orthotic (splint, night guard, occlusal guard), which is designed to relax these muscles, the actual cause of the muscle activity will need to be addressed by Dr. Woolwine in order to give long-lasting relief from the disorder. Headaches are one of the most common symptoms of TMD. Forty million Americans who suffer from headaches may have been improperly diagnosed. "Migraines", tension headaches, and sometimes even sinus headaches are diagnosed based on subjective symptoms reported by the patient, sometimes leading to incorrect diagnosis and treatment. Headaches have many causes that can be only determined by careful pain history evaluation, accurate diagnostic procedures and possibly digital imaging techniques. The most common causes are muscle tension headaches and migraines. Muscle tension headaches usually occur in the temples or neck and are constant and sometimes throb. Migraines are associated with neurological suymptoms and may include light sensitivity and dizziness (the most common). Sinus headaches are usually a "pressure" feeling in the forehead and under the eyes. There are many other types that are less common and some that are life threathening. Dr. Woolwine can determine the optimal position of the jaw by creating an ideal bite on a device called an occlusal (or bite) splint appliance. This occlusal splint is a therapeutic device that is readjusted until we create the best naturally balanced bite possible on the splint. This does not involve any trimming of your natural teeth and is fitted over either your upper or lower teeth. Once this balance is achieved a relaxed position of the head and neck muscles occurs, allowing proper stable repositioning of the jaw. More definitive, long term stabilization may then include adjusting the bite and rebalancing through reshaping of the teeth, repositioning of teeth orthodontically, or the rebuilding of teeth with anatomically correct dental restorations. Many medical specialists may not be aware of the link between your bite and headaches. Most people with this condition are not aware of what a correct bite feels like because they have always had conflict between their teeth and jaw. Dr. Woolwine is trained to determine whether there is a link between headaches and the way your teeth fit together and if there is a relationship with headaches. We can treat these problems without drugs by helping the bite fit better with various modalities including bite analysis, bite rebalancing or equilibration, use of night guards and occlusal splint therapy.